The three types of geophysics equipment used to scan The Berth: a resistivity meter, ground- penetrating radar and a proton magnetometer. The geophysics survey of The Enclosure at The Berth. Berth Hill can be seen in the background. Thankfully, the Song of Llywarch the Old states that Cynddylan was buried in a specific location at the Churches of Bassa: somewhere referred to as “Trafael’s Acre”. There was only one spot at The Berth matching the description: the oval field, approximately an acre in size, now called The Enclosure. Graham therefore knew where to look. He also knew what to look for. Cynddylan had been an historical figure who lived during the mid-seventh century, and archaeology has revealed that during this period the dead were usually interred in a circular pit, and high-status warriors were often buried with weapons, such as an axe, sword or shield. Only a professional archaeological survey could reveal if there was indeed such a grave in The Enclosure at The Berth. The Berth is on private land, and because it is also listed as a protected site, an excavation was initially out of the question. However, these days, modern technology has made it possible to see what lies buried beneath the ground without the need to dig. 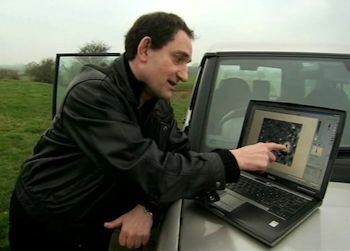 It’s called geophysics, where various types of equipment, such as ground- penetrating radar, can produce computer-generated images of what hides in the soil. 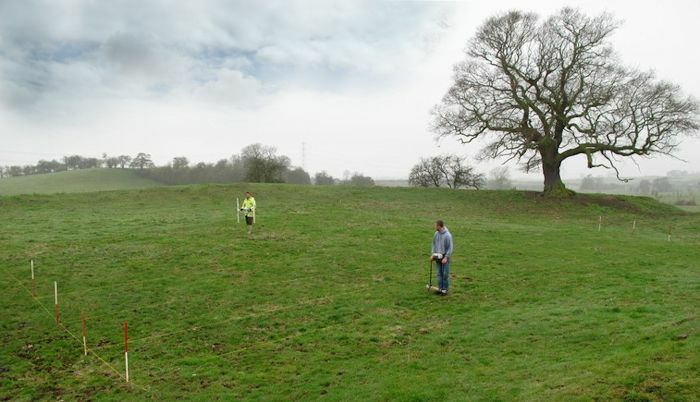 Graham organized a geophysics survey of the area, overseen by archaeologist Dr. Roger White of Birmingham University, which revealed disturbances in the ground, right in the middle of The Enclosure. At some point in the past, a single circular pit had been dug here to a depth of around six feet. The archaeologists were certain this had not been a house or any other similar structure, and was likely to have been a burial. It was indeed precisely what would be expected of a royal burial from the early Dark Ages. Furthermore, at the centre of the ditch there was a diamond-shaped piece of metal about six inches wide, possibly the central boss of an ancient shield. As it was a single, isolated burial the archaeologists concluded that it was probably the grave of someone important. Although the technical restraints of the equipment made it impossible to reveal the presence of aged and fragile bones at that depth, the scan had produced compelling evidence that there was indeed a grave right where the ancient poem said King Cynddylan was buried. And if the poem was right about that, then it may well have been right about the Churches of Bassa being the burial site of earlier kings of Powys, including Owain Ddantgwyn whom Graham had identified as the historical King Arthur. The entire area of The Enclosure was surveyed by the geophysics team and no other indications of graves were found. It’s possible then, as the last native Briton to rule this region before it was abandoned to the Anglo-Saxons, that Cynddylan was buried alone in a special location previously reserved for some purpose other than burials. If the other kings were interred at The Berth, then Berth Hill would seem the most likely location for their graves. Intriguingly, Berth Hill was an island during the Dark Ages. Could it have been the historical isle of Avalon where, according to legend, Arthur was taken after he was mortally wounded during his final battle? The name, The Berth, was only applied to the site in relatively recent times, as a place where boats from the lake were moored. Its original name has gone unrecorded. Whether or not it was ever called Avalon, it was certainly similar to many ancient Celtic healing and burial sanctuaries found on lake islands throughout the British Isles. The problem was there might be dozens of burial pits on Berth Hill. How would it be possible to determine which was of them was Arthur’s? Graham needed more to go on. Drawing by archaeologist Ruth McDonald of Liverpool University showing the human remains that might lie buried at the centre of The Enclosure at Baschurch.